Adult Heavy BlendVintage 1/4-Zip Cadet Collar Sweatshirt. 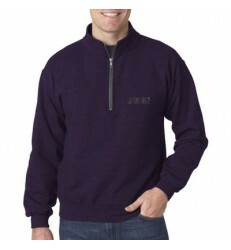 Soft but never flimsy, this 1/4-zip cadet collar sweatshirt is solid enough to keep the chill out. 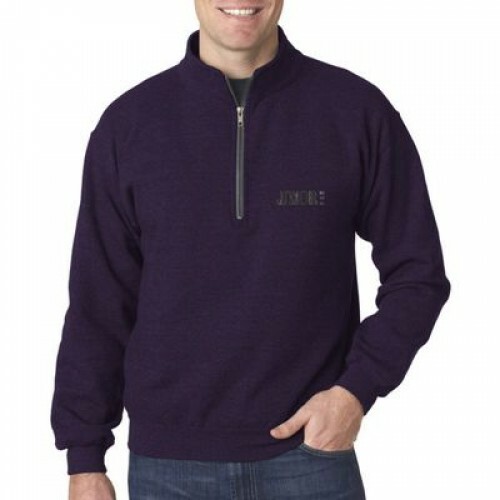 Preshrunk 50% cotton/50% polyester, 8-oz., air-jet yarn for softer feel and no pilling, cross-dyed shades (2 colors in one fabric), contrast fleece lined collar, contrast dark grey twill tape, YKK brass 1/4-length zipper with contrast dark grey trim. Just find your favorite themed design, choose an ink color and we'll add your name and date to create your one-of-a kind favor. Wondering what your personalized graphic will look like? No problem! You'll have the chance to approve your design before we print your favor. This product has a minimum quantity of 5.